Owari is a theme designed to document your adventures. With a distinctive layout and a strong focus on photography, Owari is an intriguing choice for a travel blog. Owari looks best when Featured Images are set on every post. Setting a post as sticky will not only pin it to the top of your blog, but also double the width of the post and display additional information. Showcase your most important work with Sticky Posts, while non-sticky posts cascade nicely down the side. This makes Owari a great choice for bloggers and photographers alike. Sticky post on the left. Standard post on the right. Owari will not crop the height of your Featured Images, granting you unparalleled flexibility when it comes to shaping your blog’s layout. 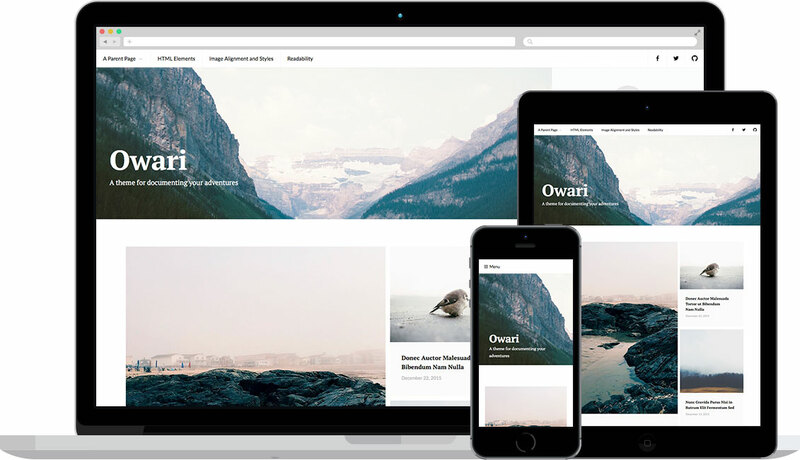 Owari is a responsive WordPress theme, meaning its layout will adapt for an optimal viewing experience depending on the type of device it is accessed from. Tablet view will push the sidebar below the main content area, giving your content more room to breathe. Mobile view will make posts flow in a single column and collapse all navigation into a single toggle button. The main column width is 1200. Featured Images for Sticky Posts are 684 wide by unlimited height on the blog homepage, and 336 wide by unlimited for non-sticky posts on the blog homepage, archive pages, and search results pages.